GIVEAWAY! - CLINIQUE Moisture Surge (All Skin Types)-CLOSED! 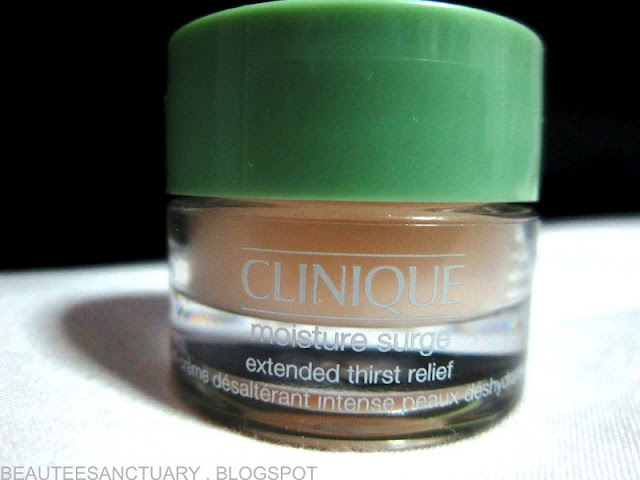 I recently reviewed the CLINIQUE Moisture Surge (All Skin Types), if you have not read it you may click on the link. This product is actually pretty amazing, but unfortunately it didn't work so well for my skin. But regardless, this product in my opinion is still pretty good. So now i'm giving away a free sample of 7ml for you ladies to try! 7ml will last your for a few months depending on how much you apply. For me, I think this 7ml could last me till half a year. How to win this product? 2. The next thing you need to do is tell me what facial moisturizer are you currently using? This Giveaway ends on 3rd of June. Winners will be announced in a blog post. If I do not hear from you within a week I will pick another winner. My favourite moisturizer at the moment is Nutox Oxyfusion Total Moisture. OK, I have joined your blog as a Reader. I'm using Bioessense's facial mosturizer, the Bird Nest range. I'm currently using SkinLab's concentrated vitamin e moisturizer. It works best on my skin. Definately worth the money lol!i would love to receive this sample from you! Hmm, seems a lots of people here already so I gonna try my luck. I am Using Caudalie Vinoperfect Whitening Cream. followed ur blog as well! Hello everyone! Thanks for joining this giveaway, I will update on the winner soon. But please be patient with me as this week is a very busy week for me, I don't even have time to blog... haha... but i will reveal the winner soon. Thank you all for your patience. :) <3.